Now as it happens I know a Japanese speaker very well. Red was easy “akai”. Green was a little tricky because the Japanese actually have two words for Green, “aoi” and “midori.” We went with midori. Refactor was a little bit tricky. After all, there was no such word in the English language until Martin Fowler published Refactoring. Indeed, “refactor” still haven’t made it into my English dictionary. Its taken me a few weeks to have an in-depth conversation about this with my translator but it seems Kevlin is right. Which seems to sum up refactoring perfectly. Now, any other Japanese speakers out there like to refactor? 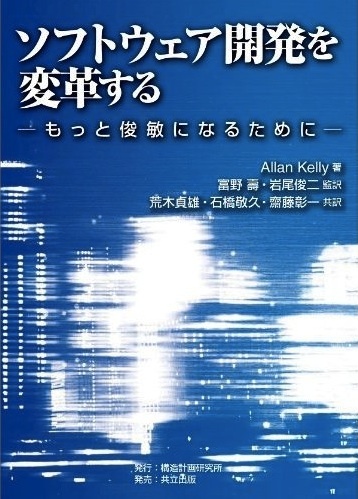 And just a gentle reminder that Changing Software Development is now available in Japanese. My personal Japanese translator didn’t do this translation, it was handled by the Japanese publisher. I’ve blogged before about “The Alignment Trap” (Originally in December 2007 and after my piece in The Agile Journal in February 2009). This is the counter-intuitive evidence that sometimes doing things right is more beneficial than doing the right think. I often discuss this in my presentations and there are two standard reactions: for some this research rings true while others question it. Those who question it often ask: is there any other evidence? Delivering Value from Information Systems and Technology Investments: Learning from success is a survey report from Cranfield School of Management in the UK. I only heard about this report a few months ago and its is now four years old but I see little reason to suspect things have changed since 2006. The researchers define four levels of maturity in organisations developing systems. The first level is project delivery with the focus on the supply side. In order to reach the higher levels organisations must first be able to successfully deliver the IT projects they undertake. In other words: doing things right is a prerequisite to success. The second level of maturity concerns realising the expected benefits from projects. Here attention expands from the supply side to look more at the demand side and whether the business cases proposed are realistic. It is here that “doing the right thing” starts to be the issue. Levels 3 and 4 concern realising benefits consistently across the whole portfolio. “Formal methodologies ... false sense of security”: That could be PRINCE2, Scrum or something else. The methodology doesn’t have the answers. You need to be pro-active and think for yourself. “Not becoming sufficiently involved”: Yet again we hear that lack of customer/user/manager involvement is a cause for failure. We have a few tools for working around these problems but nothing beats having actual involvement. Slides from my Agile Cambridge 2010 Objective Agility: What does it take to be an Agile company? online now. Reuse Myth - can you afford reusable code? In my Agile Business Conference present (“How much quality can we afford?”) I talked about the Reuse Myth, this is something always touch on when I deliver a training course but I’ve never taken time to write it down. Until now. Lets take as our starting point Kevlin Henney’s observation that “there is no such thing as reusable code, only code that is reused.” Kevlin (given the opportunity!) goes on to examine what constitutes “reuse” over simple “use.” A good discussion itself but right now the I want to suggest that an awful lot of code which is “designed for reuse” is never actually re-used. In effect that design effort is over engineering, waste in other words. One of the reasons developers want to “design for reuse” is not so much because the code will be reused but rather because they desire a set of properties (modularity, high cohesion, low coupling, etc.) which are desirable engineering properties but sound a bit abstract. In other words, striving for “re-usability” is a developers way of striving for well engineered code. Unfortunately in striving for re-usability we loose focus which brings us to the second consideration.... cost of re-usability. Think about this. This means that you have to use your “reusable” code three times before you break even. And it means you only see a profit (saving) on the fourth reuse. How much code which is built for reuse is reused four times? I would suggest the answer to this question is: very little. Consequently development teams which write a lot of reusable code are costing their organisations a lot of time and money. Waste. Reusable code is not the solution to any of our IT problems. It is a supply side only solution and not a very good one at that. While it may reduce the amount of code that is written it reduces it by artificially constructing supply rather. Thus, reuse, as a solution to software supply problems, is a myth. This leave two questions we need to answer. First: how are we to get those desirably engineering properties if we can’t/don’t push reuse? The good news here is that Test Driven Development, i.e. writing code that can be automatically tested with other code we write, also has the effect of promoting modularity, high cohesion, low coupling, etc. Thus the answer to this question is: Make your code testable. This approach will retain focus and deliver worthwhile benefits. The second question: How should we manage reuse? After all, there are some genuine situations were reuse is the right answer. Here there are two answers, a micro and a macro answer. The micro answer, when your working in a development team is: look for emergent reuse. Don’t plan for reuse but look for opportunities to reuse something that has gone before. When you see the opportunity take the previous work and enhance it just enough to reuse it in your case. This way you only pay the price for what you actually need when you need it. If you later find the same code is useful again then repeat the process. Improve it just enough to use it a third time. Remember: you have the tests from the earlier answer to make it safe to do this. Without the tests things get difficult. Now you’ve reused your code three times, you’ve pay the price a bit every time, and you have the tests to show it still works. By now the code is going to be getting pretty close to generically reusable. Still, maybe you go round this look a third or fourth time. It doesn’t matter is making one piece of code reusable costs more in the long run than it would have done if you did it the first time because... You haven’t spent money making a lot more code reusable that never needed it. Telling the future is hard. It is difficult to know whether code will be reused or not, so default to Not and save the money. Occasionally you will be wrong and it will cost more, but overall you will be right and you will save money. The macro answer: if this code really is widely reusable by many people then, go into business. Market this as a library, a plug in, an application what ever. Let the market decide the economics of reusability. My conference overdose continues with Agile Eastern Europe in Kiev this week. This was going to be a simple repeat of my Business Analyst in Agile talk which I’ve given a few times before. If I’m being honest, I don’t feel this presentation worked as well as I’d like. Maybe because I changed it, maybe because I’ve delivered it too many times before, maybe because it was 3pm. Time for reflection. Sorry Kiev, will try harder next time. My presentation from the Agile Business Conference (ABC) 2010 is now online: Quality - How much can we afford? Continuing my mini-series on filling an iteration, velocity and all that I want to flag up a big big mistake: Velocity Targeting. Which leads to Velocity Inflation. Velocity targeting happens when someone says: “We did 15 points last iteration, lets aim for 20 this iteration”. And when the team fails to meet 20 they say something like: “What happened? We didn’t meet our target?” - or perhaps they start assuming that because the target is 20 the can adjust the plans and message to stakeholders accordingly. We can all fall into this trap: its called Hope. We hope for a better world. When it gets dangerous is when the person issuing such statements is in some position of authority, e.g. the word “manager” or “leader” is in their title, and they start issuing communications with the target as reality. Given a few iterations the team will meet the target. However the means they use to meet the target may not be what is expected. And these may well create problems later on. For example, the team might skip on testing or skip on refactoring. This results in a short term speed up which sacrifices long term maintainability and flexibility. You might actually choose to do this, with the agreement of the authority person, but this should be a conscious decision and you accept the long term slow down. In some ways this too is natural. Team members want to appear more successful, they want to achieve more, they want to please people - especially those who are in authority and set targets. But, and this is the real danger of Velocity Inflation, it undermines your ability to predict the future work capacity of the team because yesterday’s values can’t be compared to tomorrows. “11 a. Eliminate work standards (quotas) on the factory floor. Substitute leadership. The solution is simple: don’t do it. If you (quite naturally) want velocity to rise you have look elsewhere. That will be the subject of my next blog entry. I want to stick with the theme of “how do I fill an iteration?” for a couple more entries. There are a lot of little nuances here, and what works for one team at one time might not be the best thing for another team, or even the same team at a different time. I appreciated Ed’s comments on my last entry, I think they go to show how small variations work well for individual teams. However, sometimes variations hold problems. Sometimes you come across a team that completes exactly the amount of work (measured in abstract points) during an iteration as they forecast they would at the start. For example: a team says it will do 10 points of work in the next iteration, and two weeks later they count up and they did 10 points of work. Occasionally this happens, thats not unusual. Over time I’d expect it to happen more often but I don’t expect it to happen every iteration. When it does then something is probably wrong. Statistically this is just very unlikely to happen. Yes a team will do roughly the same amount of work but exactly No. They are not doing the same work, the same tasks, the same events will not occur, the same people won’t work on the same things - and if they did we would expect them to get more done. So when a team regularly scores the same points, week after week, as they expect to (and by implication the same number they did the previous iteration) then some force is making it happen. The real number should be higher or lower. If the real number should be lower it means the team is busting a gut to do the work. Maybe they are working long hours, or maybe they are cutting on quality. Either way the work pace is unsustainable and problems are being stored up. If the real number should be higher it means the team is satisficing. That is, they have the capacity to do more work but they are not taking it on so there is spare capacity. Sustainable yes, but not as productive as they could be. I recently worked with a team led by a manager who would not allow the team to take on more work than they could guarantee doing. He did this because he didn’t want to explain to the project manager running the project that the team hadn’t done as much as they had scheduled. The project managers in this company wanted predictability. If that is important to you then that’s a reasonable thing to do. But this company was trying to “go faster”. The managers were making a trade off: less work for more consistency week-on-week. My preferred method is to always schedule slightly more work than the team expects to do. This way there is more work to do if the team find things go well. And if they don’t go well, or if they go badly, then nobody should have been expecting everything to get done anyway. The fixed length iteration is a key part of most Agile methods. But the question is: how do you know what (i.e. how much) to put in the iteration? There are two ways to determine how much is enough but what might be less obvious is that they are alternatives. It is easy to outline both and pretend they work together but really they don’t fit together. The first way, lets call it the Scrum way, is to set a Goal. The team then commit to making this Goal. The objective is to find a Goal which is both achievable and challenging, and useful but small enough to fit in an iteration. In this model the Product Owner comes along with some idea of what they want, the team talk about it with the Product Owner and, through conversation, come to an agreement on what can be achieved. The team then go for it. The team “do what it takes” - if they need to work long hours they do; if they need to bang-heads together, they do; if they need to spend their own money, they do. Given this, one would assume that in those iterations where the team don’t have to move heaven-and-earth they could take things easy. If one iteration they work 14 hour days a reasonable quid-pro-quo seems that in those when they can finish a day early they do. If at some point the team decide they can’t make the Goal, or the Product Owner says the Goal is compromised - things have changed and it is no longer wanted - then the team declare an Abnormal Termination of Sprint and everything starts over. The problem with this way of doing things is around sizing the Goal. According to the Scrum literature, by aiming for a Goal the team rally round and choose to stretch themselves. The danger is that the development team start satisficing, that is: they promise enough to keep people happy but not so much that they are ever in danger of failing to meet the Goal. Those who worry about satisficing probably also worry about what happens if the team meet the Goal early. This isn’t really explained in the Scrum literature I’ve looked at but I’m told that there should be a quick, mini-planning meeting with the Product Owner and some new work accepted. At which point I wonder: what happened to fixed iterations? Conversely, looked at form the opposite point of view: what is to stop the business side putting on the developers and exploiting the situation to set difficult, time consuming, Goals? There are plenty of developers in the world who have been bullied by their business partners into giving estimates which meet the business desire but have no real relation to the amount of time and effort it will really take. Either way, the fundamental problem remains: how do you know how big to make the Goal? Unless both sides change their mindset then the Goal driven model doesn’t really change anything. And changing mindset on both sides is a big task. One which doesn’t fit well with a gradual adoption approach. Actually, I don’t think many people use the Goal driven approach to filling an iteration. If they did then I would expect to here about teams having spare time more often, and I would expect to hear about more Abnormal Termination of Sprints. I don’t hear of either so I don’t think this technique is used very often. The second way of deciding how much to put in an iteration is to use an empirical measurement, i.e. velocity, lets call this the XP way. In the model the Product Owner proposes some work as before. The development team do some quick estimates on how much effort is involved, the work is prioritised and work begins. The first time you do this you don’t know how much work to put in the iteration - how could you? You’ve not done this before. But the second time you can count how much work you did before and use this as a guide. Iteration on iteration this count becomes more accurate and its what we call velocity. The technique of using the previous velocity to project the amount of work in the next iteration is called yesterday’s weather. I prefer to use this technique and when I do I always slightly overload the team in the next iteration. That is, I schedule slightly more work than I expect them to do and everyone knows there is slightly more work than is expected to get done. In other words we expect something not to be done. There is no point in scheduling even more work because the team isn’t expected to do it. There is no point in scheduling less work because it might be that the team has spare capacity. If we get luck all the work we scheduled gets done, and if it doesn’t... well nobody should be expecting to get everything done, its just a question of how much. I don’t update the estimates with actuals because that would be mixing apples and oranges. Estimate counts go in, estimates counts come out. There are several problems with this technique. You cant be sure what will get done and what won’t, for some people that’s a big issue. Secondly, people like to relate the estimated effort levels to hours or days. When that happens the estimates become less accurate. More importantly, the Goal driven method aims to stretch the team by challenging them to do something bold. Using velocity and yesterdays weather approach doesn’t even start to do this. The team are immediately satisficing. Both these techniques have been advocated and used but what isn’t pointed out very often is that they are alternatives. If you use them together you definitely are satisficing to meet a Goal. Using commitment to stretch the team goes out the window. Unless of course you set stretch goals, in which case you are ignoring velocity.